Now that fall is here we are using the outdoor kitchen more than ever. 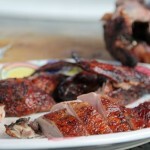 The cool evenings are perfect to use the outdoor kitchen for “slow food” like this Grilled Duck with Red Wine Marinade. 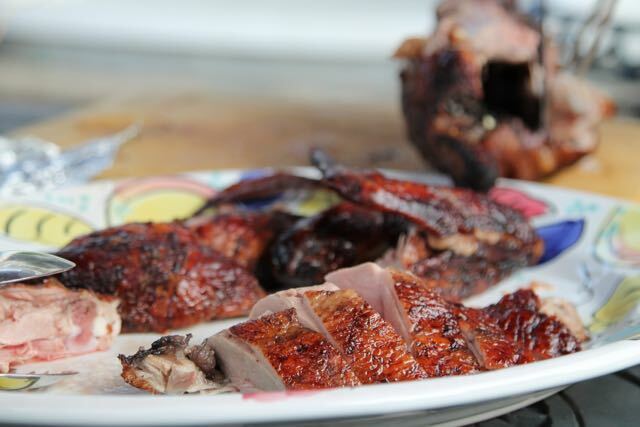 Duck can be intimidating but let me assure you, this recipe is so impressive, easy and elegant. I encourage you to try it! 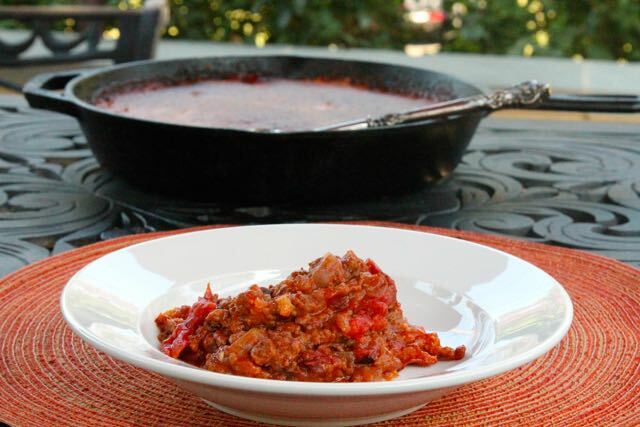 This recipe is based on one I found in the Chez Panisse Menu Cookbook, with my own twist. It was amazing. 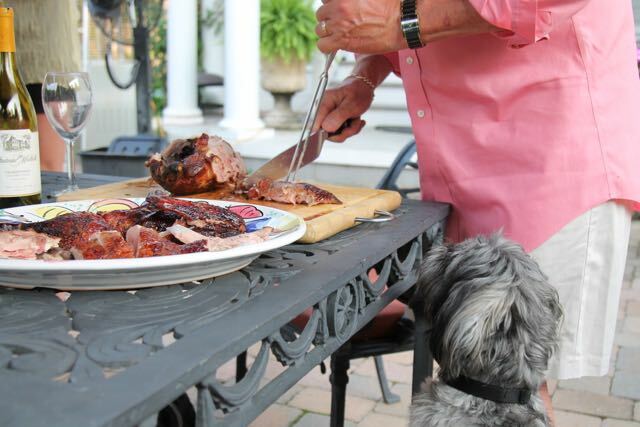 The recipe calls for flattening the duck and grilling it over charcoal. We have a gas grill so I have to be creative. To infuse flavor I use the rotisserie for the duck over an old cookie sheet filled with fresh herbs. How can you go wrong? Unwrap the duck and make sure the cavity is clean and patted dry. Take a fork or the point of a knife and prick it all over at least 50 times. Place the carrots, onions, crushed peppercorns, bay leaves, salt and red wine in a 5 quart pan and heat to a boil over medium heat. Lower the heat and simmer together for 15 minutes. Remove the pot from the heat; add half of the herbs and cool to room temperature. Place the duck in a 2 quart zip lock bag and pour the cooled marinade over it. Place it in a roasting pan and refrigerate for 12 -24 hours. Set the duck and it's marinade at room temperature for one hour before grilling. Drain the marinade and separate the solids and bring the liquid to a boil over medium heat, simmer for 15-20 minutes until reduced by half. Skewer the duck onto the rod and place on the grill. Line a cookie sheet with heavy duty foil and place it under the duck, the fill it with the remaining herbs. Baste the duck as it turns on the rotisserie with the reduced marinade for 30 - 35 minutes until a thermometer reads 125 degrees when inserted into the thickest part of the thigh. 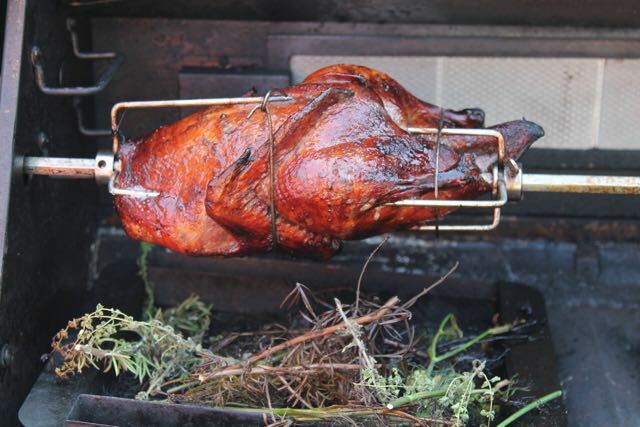 Remove the duck from the rotisserie and cover with foil. Let it rest for 30 minutes and carve onto a serving platter. I was intimidated until I read through your recipe and saw the amazing images. Now I’m motivated to make this gorgeous dish. I can’t wait to give it a try this weekend.